This class will introduce your toddler to fun, age-appropriate activities in the gym. Pre-school gymnastics equipment, obstacle courses, parachute, bean bags and music will be used daily. Class will aid large muscle development as well as increase socialization. Child must be accompanied by an adult. 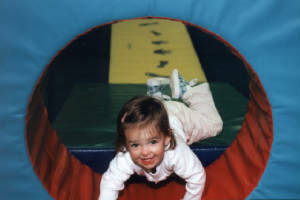 This class is specifically designed for the older toddler with similar activities from Tiny Tumblers, but more emphasis on tumbling and gymnastic instruction as child shows readiness. Tuesday 10:00-10:45 A.M. or Thursday 10:00-10:45 A.M. or Saturday 9:15-10:00 A.M. This exciting program will combine gymnastic activities, creative movement, music, story time and other age appropriate pre-school activities. Children will develop a better understanding of themselves, release energy and build confidence. Get your pre-schooler into the swing of things early. 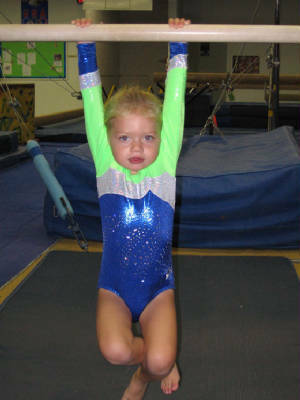 Basic gymnastic instruction on equipment including bars, balance beams, springboard, trampoline and more. A confidence building and readiness program for any sport. Monday 6:00p.m.-6:45p.m. or Tuesday 11:00-11:45 A.M. or Thursday 11:15a.m. - 12:00p.m. Monday 6:00-7:00P.M. or Wednesday 1:00-2:00 P.M. or Wednesday 6:00-7:00 P.M. or Thursday 11:00-12:00 P.M. or Saturday 9:00-10:00A.M. Free sample classes for Beginners, Mini-Tumblers, and All About Me are usually available the Tuesdays between sessions. Check with the front desk to register. (only new students please! ).